The concept of being under one ruler’s protection, while in the lands of another, has probably existed since rulers and lands were first invented, but the earliest mention of an object we might recognise as a passport appears in the Bible, in the often overlooked book of Nehemiah. In the month of Nisan in the 20th year of the ancient Persian king Artaxerxes (around 450BC in new money), the prophet, who was working as a royal cup-bearer, is granted letters from the king requesting the governors of the lands beyond the Euphrates to grant him safe passage to Judah. The purpose of Nehemiah’s visit, incidentally, was to rebuild the walls of Jerusalem. In Britain, the earliest surviving reference to a “safe conduct” document appears during the reign of Henry V, in an Act of Parliament dated 1414. At that time, documents like these could be issued by the king to anyone, whether they were English or not. Foreign nationals even got theirs free of charge, while English subjects had to pay. Needless to say, the monarch did not – and still does not – need a safe conduct document. From 1540, the granting of travelling papers became the business of the Privy Council. By this point the term “passport” was being used, although whether it originated with the idea of people passing through maritime ports or through the gates in city walls (“portes” in French) remains a matter for debate. A passport from this period, issued on June 18 1641 and signed by Charles I, still exists. From 1794, the office of the secretary of state took control of issuing passports, a function that the Home Office retains today. Records remain of every British passport granted from this time, although they continued to be available to foreign nationals and were written in French until 1858, when the passport first acquired its role as a British identity document. Nevertheless, passports were not generally required for international travel until the first world war. It was in the early 20th century that passports as we would recognise them today began to be used. The first modern British passport, the product of the British Nationality and Status Aliens Act 1914, consisted of a single page, folded into eight and held together with a cardboard cover. It was valid for two years and, as well as a photograph and signature, featured a personal description, including details such as “shape of face”, “complexion” and “features”. The entry on this last category might read something like: “Forehead: broad. Nose: large. Eyes: small.” Remarkably, some travellers claimed to find this dehumanising. 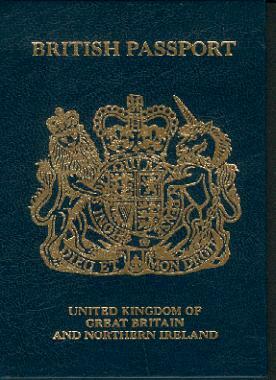 Following an agreement among the League of Nations to standardise passports, the famous “old blue” was issued in 1920. Apart from a few adjustments to its duration and security features, the old blue remained a steady symbol of the touring Briton until it gradually began to be replaced by the burgundy-coloured European version in 1988. The passports of other countries are, on the whole, remarkably similar to Britain’s, although some do have their quirks. The new Nicaraguan passport, for instance, boasts 89 separate security features, including “bidimensional barcodes”, holograms and watermarks, and is reputed to be one of the least forgeable documents in the world. The Israeli passport, through no flaw in its design, must be one of the most useless, as it is not accepted by 23 different Muslim countries, nor by Cuba or North Korea. The Vatican, incidentally, has no immigration controls, but it does issue passports. The Pope, among his other honours, always carries “Passport No 1”. The passports of the future will feature embedded microchips and biometric data, such as photographs, fingerprints and iris patterns. Malaysia was the first country to introduce this technology, and Australia, New Zealand, Japan, Sweden, the UK, the US, Germany, the Republic of Ireland and Poland, among others, have recently followed.